As a business, we’re always on the lookout for solutions to tackle the single use plastic issue and here’s another one that we hope is going to prove popular with our customers. 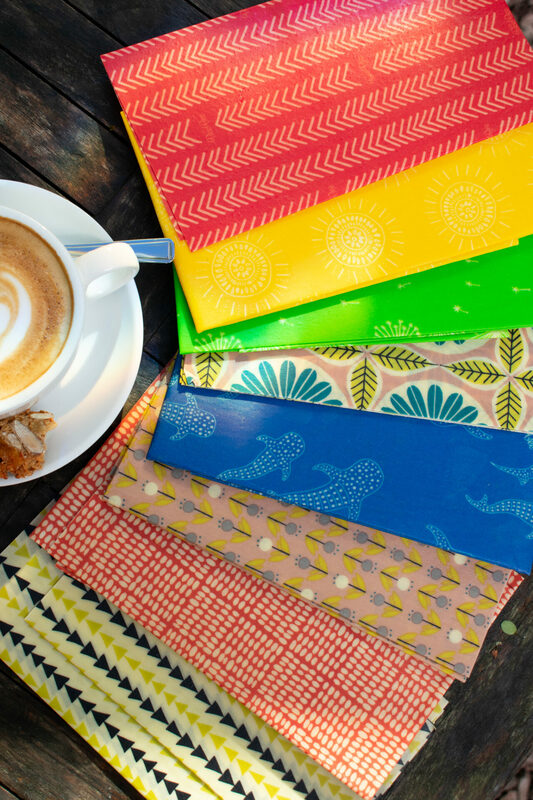 If you’re looking for an environmentally sustainable alternative to clingfilm without the bulkyness of tupperware, then these organic cotton and beeswax food wraps will be right up your street. Available in our shops from this week, these colourful little numbers come from Cambridge based supplier Bee Bee wraps. Bee Bee is the brainchild of Kath Austin,who, inspired by a conversation with a friend (and the fact that cotton and beeswax has been used as a food wrapping tool for centuries) started experimenting in her kitchen with various formulas until she hit upon the perfect one…and the Bee Bee wrap was born. The wraps are ethical and sustainable from cotton grower to production, with the company working closely with their beekeeping communities to perpetuate the pollinating population and they aim to be zero waste in everything that they do. Simply made from organic cotton, beeswax, tree resin and organic jojoba oil, the wraps are completely compostable but if cared for properly, each wrap will last at least a year. They are breathable and won’t cause food to ‘sweat’, therefore increasing the shelf life and cutting food wastage to boot. Bee Bee use low impact dyes and are confident that, whilst the wraps have a beautiful ‘beeswaxy’ scent, this does not taint food at all and does fade with use. Inspired? Come and pick up yours from any of our shops. The wraps are available in packs of 2 large (£14) 3 medium (£14) 3 mixed size (£14) or 1 giant (£16) and a range of bright, contemporary designs.